Set your table with Elegance!! Enjoy our new line of premium designed plastic octagon plates with a lace border. 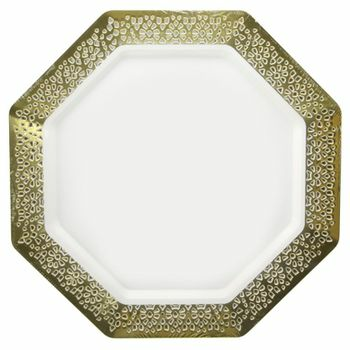 This unique pearl colored plate with gold lace border is great to use at any formal function. Available in 11", 9", 7" and bowls as well. Not everyone likes a circular plates and crave something different. These gold plastic plates give you a classic look, but that little extra special shape. Imagine your wedding or other special occasion filled with these amazingly beautiful disposable plates. They look just like fine China, but cost much less and are far more durable. What's even better is these plastic plates for weddings don't need to be washed, just throw them away. Lacetagon 11" Pearl w/ Gold Lace Border Octagon Banquet Plastic Plates 10ct. Lacetagon 9.25" Pearl w/Gold Lace Border Octagon Luncheon Plastic Plates 10ct. Lacetagon 7.25" Pearl w/Gold Lace Border Octagon Salad/Dessert Plastic Plates 10ct. Lacetagon 14oz. Pearl w/Gold Lace Border Octagon Soup Bowls 10ct. Lacetagon 5oz. Pearl w/Gold Lace Border Octagon Dessert Bowls 10ct.